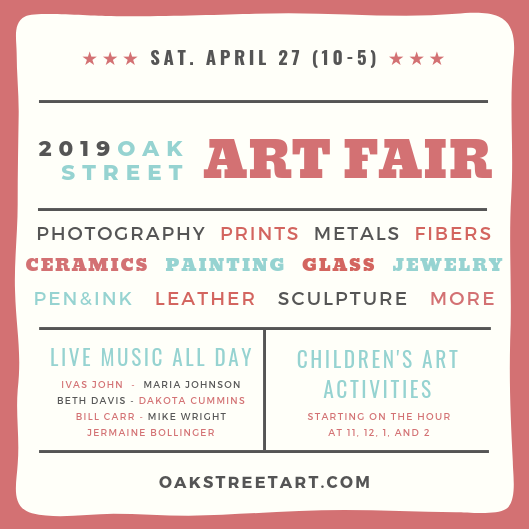 Saturday, April 27, 2019: Fourth Annual Oak Street Art Fair! Watch for updates. February 8 - March 5, 2019: A series of works from Oak Street Art member and painter Rachel Malcolm Ensor will be on display at the Varsity Center in Carbondale, Illinois. Details here. January 24 - February 20, 2019: Oak Street Art member and printmaker Luca Cruzat's work "Vulnerable" will be on display as part of the Delta National Small Prints Exhibition in Jonesboro, Arkansas. Details here. January 12 - February 13, 2019: Work from Oak Street Art member and ceramic artist Darby Ortolano was selected for inclusion in the juried "Attention to Detail" exhibit at Art St. Louis. Details here. January 11 - February 23, 2019: Oak Street Art member and painter Rachel Malcolm Ensor's piece "American Quilt Series #2" will be on display at the St. Louis Artists' Guild, as part of the Ann Metzger National Biennial exhibit. Details here. November 30​, 2018: Oak Street Art members worked one-on-one with close to 200 children to make their own tree ornaments during the Murphysboro Hometown Christmas celebration! Photo credit: Murphysboro Main Street. November 18​, 2018: Shop 304 pop-up sale at Artspace 304 through Carbondale Community Arts. OSA members Sue Gindlesparger (metals, jewelry) and Darby Ortolano (ceramics), along with other local artists, will have items for sale. November 3​, 2018: Oak St. Art joins The Women's Center at The Old Feed Store venue in Cobden, Illinois, for their fundraiser serving Union County survivors. October 21 through December 30, 2018: Shrode Photography Competition Exhibition at the Cedarhurst Center for the Arts (Regenhardt Gallery) in Mt. Vernon, Illinois. Two pieces by OSA member Ann R. Fischer were accepted for the competition and are now on display. ​Breaking news: Ann's "Abstract, Colored Straws" won First Place. October 6, 2018: A Woman's Work is Never Done at the General John A. Logan Museum in Murphysboro, Illinois. Come see OSA members Shirley Krienert (weaving, mixed media), Cathy Schmidt (leather), and Rachel Malcolm Ensor (painting, mixed media). Works by all 7 Oak Street Artists will be available for sale. Sunday, November 19, 2017: Five Oak St. artists are showing their work at the curated Shop304 Showcase pop-up sale, along with 20 other area artists. Details here. September 23, 2017: Oak Street Fine Arts Fair. Short video from the 2016 fair, courtesy of WSIL-TV. July 5 - September 1, 2017: Five Oak Street artists are featured in the exhibit "Locality" at 304 Artspace in Carbondale. See our blog post for more info and images of our work on display. Check our blog, Facebook, and Instagram for updates!